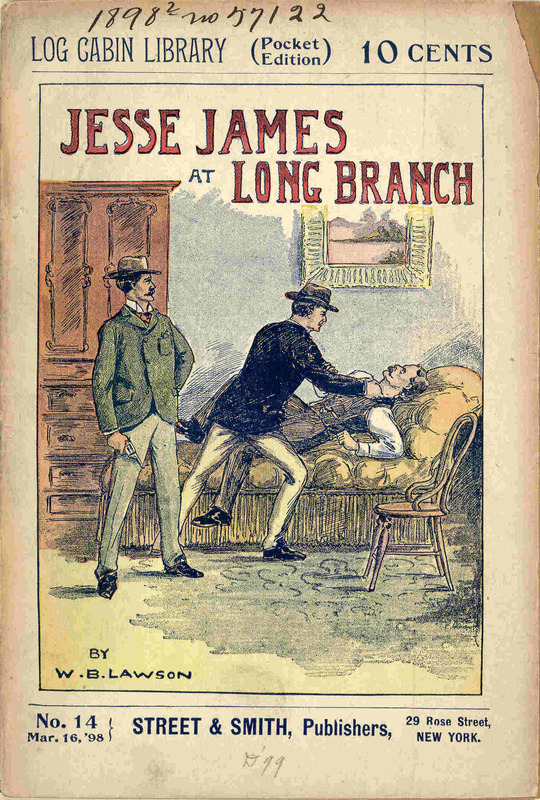 Jesse James became the subject of young-adult fiction not long after his death in 1882. 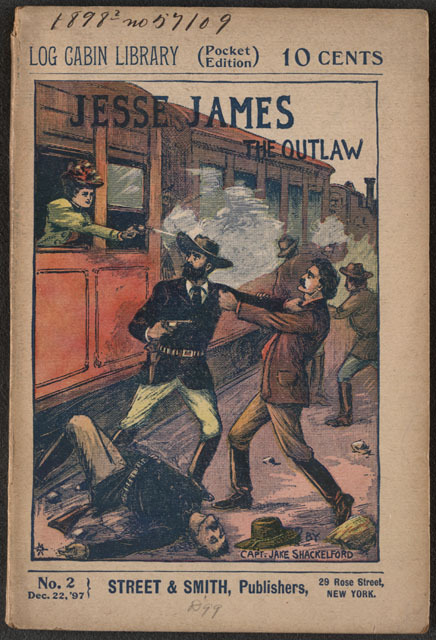 This image depicts the cover of a dime-novel, entitled Jesse James the Outlaw, which was published on December 22, 1897. Today this book is featured in "American Treasures of the Library of Congress - Imagination." When the war was over, Jesse tried to surrender to Union troops in Lexington, Missouri. His white flag was greeted with a bullet in the chest. Back in the saddle, Frank and Jesse joined forces with Cole Younger and his brothers. Although the war was over, Jesse claimed it was fine to keep fighting against Northern interests because his family had been harmed during the conflict. He and his companions robbed banks (until owners began to use time-locks on their vaults), stages and trains for the next fifteen years. With Edwards writing glowing stories of their exploits, Frank and Jesse were contemporaneously known as modern-day Robin Hoods. 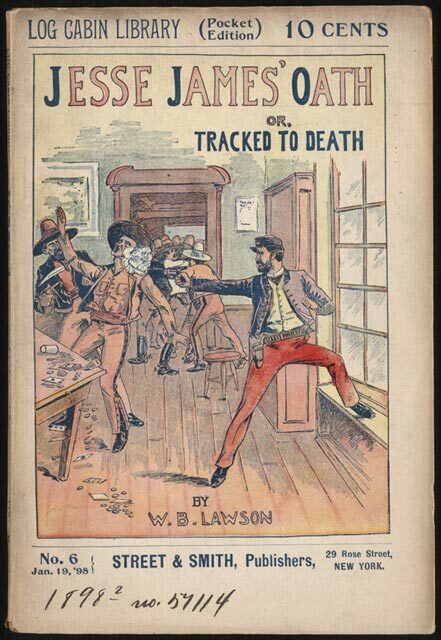 Beginning in the 1860s, “dime novels” were an inexpensive way to entertain adolescents. 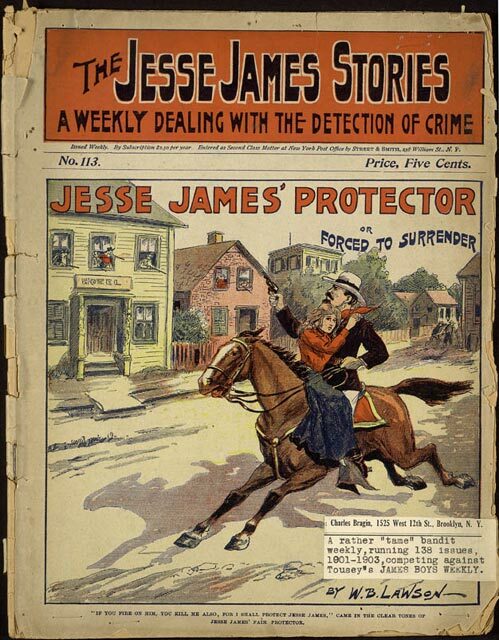 Some of them were adventure stories about “the War for the Union.” Others featured Buffalo Bill, the Wild West, a cowgirl named Stella and Jesse James. Allan Pinkerton was at least one person not at all amused by the James brothers and their gang. He, and his detective agency, tried to track and arrest the members for years - to no avail. By 1874, Jesse’s exploits were an issue for Missouri politics. Prospective government officials wanted to stop - or at least suppress - outlawry so “capital and immigration can once again enter our state.” However ... the only notable events that year, regarding the James brothers, were their marriages: Jesse to his first cousin, Zee Mimms, and Frank to Annie Ralston. During the first month of 1875, a Pinkerton agent named Jack Ladd decided to work as a field hand across the street from the James-Samuel farm. It was just a cover, since his real objective was capturing Jesse and/or Frank. On the 26th of January, six Pinkerton employees surrounded the house where Jesse’s mother still lived with Dr. Samuel and their children. Eight-year-old Archie Samuel was home that day. When the Pinkertons threw a smoke bomb into the home - attempting to force out whomever was inside - young Archie thought it was just a loose stick. When he threw the device into the fireplace it exploded, killing Archie and ultimately causing Zerelda to lose her hand. Retaliation was swift - and deadly. On the 12th of April, 1875, Dan Askew, the neighbor who allowed Jack Ladd to work undercover on his farm, was found with a bullet through his head. Jack Ladd was also shot and killed that month. Their murders were never solved. Living in various places, Jesse and Zee had two children: Jesse Edward and Mary Susan. They would not see their father live to an old age. Bos, Carole "LEGENDS OF JESSE JAMES" AwesomeStories.com. Oct 01, 2007. Apr 23, 2019.